I am back home and recovered from the Birding Rally Challenge in Northern Peru (Rally). How do I describe the Rally? Well, I will start by saying I am not new to non-stop birding; some friends and I tried to break the 24-hour record number of birds in Florida (Big day). Think of the Rally as eight consecutive big-day attempts…it was grueling and exciting. The 1,500 km route included a great diversity of habitat types, elevations along the west and east facing slopes of the Peruvian Andes, jaw dropping landscapes, contrasting microclimates, cultural diversity, and a potential list of well over 1,000 species. From Waved Albatross and Blue-footed Boobies to Neblina Tapaculo and Andean Condor, and from Tumbes hummingbird (a dull-colored hummer of the western lowlands) to the outlandish Rainbow Startfrontlet and Rufous-crested Coquette, we counted a combined total or 864 species during the Rally! 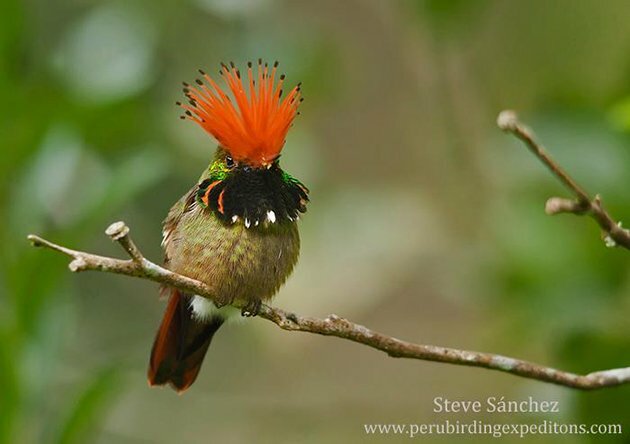 Male Rufous-crested Coquette, a specialty of the eastern Andean foothills. Photo: Steve Sanchez. It was such a hectic eight-day competition. The Birding Rally Challenge consisted of multiple segments where six teams birded from dawn until dark. Teams received the wakeup call at 4:00 AM and were expected to turn in the day’s checklist by 8:00 PM. Each segment had predetermined sites all teams had to visit, other than the pre-determined sites, teams were free to go and stop anywhere they wanted, as long as they turn their list on time. Failure to visit the mandatory sites resulted in a penalty, which consisted of being held one hour at the beginning of the next segment. One hour of birding during the morning activity can make a big difference in a cutthroat competition like this. 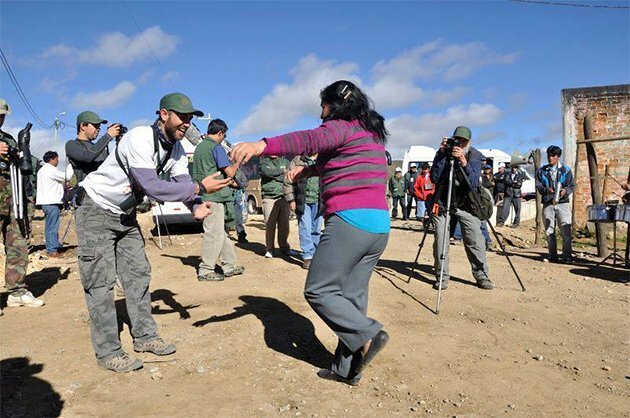 The idea behind the Rally was to highlight Peru as a birding and nature travel destination. Most of the predetermined stops were popular birding sites. Other stops included short visits with local authorities at the communities that own these sites and other bird habitat. The idea is that by engaging these communities, people would not only take pride and protect these sites, but also will see them as potential sources of revenue as visitors pay small entrance fees and spend money hiring services and purchasing goods from these communities. The organizers, the Peruvian Tourism Board (PromPeru) and Inkaterra Hotels Association saw this event as an opportunity to foster environmental awareness and introduce the idea of bird habitat conservation. Local communities embraced the idea behind the Rally and were happy to receive the participants. Photo: Peru Birding Rally. Local communities embraced the idea in ways that exceeded expectations. The Rally was on the regional news and international teams were received and greeted as locals would greet government authorities and celebrities. Everyone in these communities became aware of this event and I am sure now has a better understanding of what birding and eco-tourism are. Official presentation of our team: The Zululanders from South Africa. Photo: Peru Birding Rally. Each team was composed of four members and a fifth birder from the host country. I teamed up with the Zululanders, a team from South Africa composed of Fraser Gear, Trevor Hardaker, Gavin Lautenbach and Ross Goode. 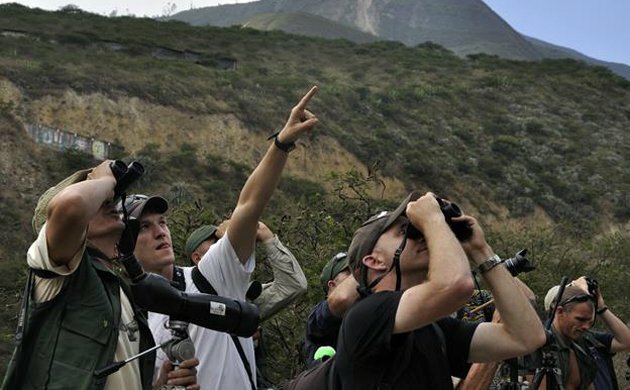 Teams were composed of experienced birders in their respective countries, but levels of expertise among birders varied from those with plenty of experience in the Neotropics, including some of the authors of the book “The Birds of Peru” to those for whom coming to Peru was their first time in Latin America. For those with little experience in the Neotropics familiarizing with the long list of birds expected along the Rally’s route was a daunting task to say the least. Interestingly, all participants did an amazing job at it. 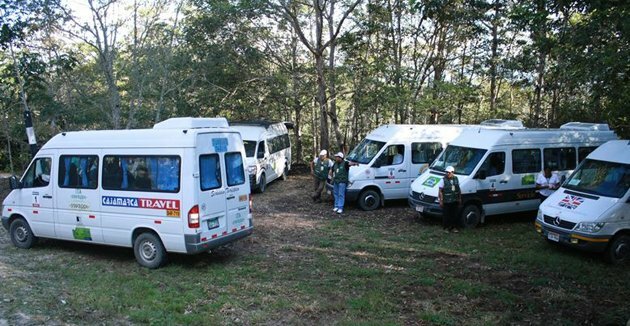 Equipped with all possible sources of information regarding the birds and sites of the region, each team had a van and two drivers to its disposal. In preparation for the Rally, two of the Zululander, Fraser and Ross arrived two weeks prior to the event to scout the route and collect as much information as they could. That was a big help. Each team had a van and two drivers for the entire Rally. Photo: Peru Birding Rally. The first day of the competition we hit all the spots performing fast clean ups with time to make additional stops. We compiled a list we were confident it would place us among the top teams. Little did we know we came in second to the last team. This was worrisome since we gave it all we had. Other teams had member with lots of experience in the western lowlands. Spain’s Tramuntana Team walking back to the van after checking the shores of the Pacific Ocean. 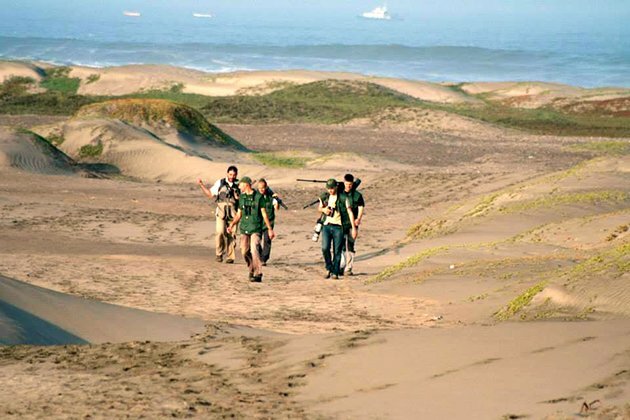 Photo: Peru Birding Rally. Even doubling the efforts the next day, we climbed only one spot. The western lowlands are characterized by semi open habitats of deciduous forests. Bird diversity is relatively low but highly endemic and localized. Those who knew where to find the regional specialties did well there. 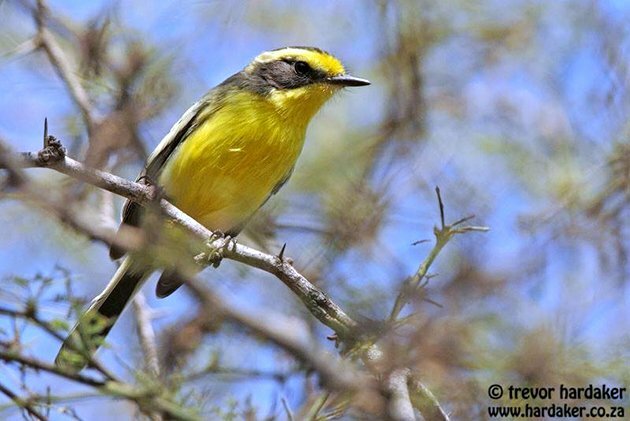 We were the only team that saw and photographed the beautiful and Peruvian endemic Maranon Crescentchest. Photo: Juan Chalco. As we ascended the western slope of the Andes, we decided to drive fast to beat the other teams to the most important birding sites. We wanted to not only be the first during the early morning activity, but also be the first to use playback on certain key species before they become unresponsive when everyone does the same. This approach also would give us a chance to spend more time at the most productive sites and even backpedal to revisit sites where we missed a few species the first time around. 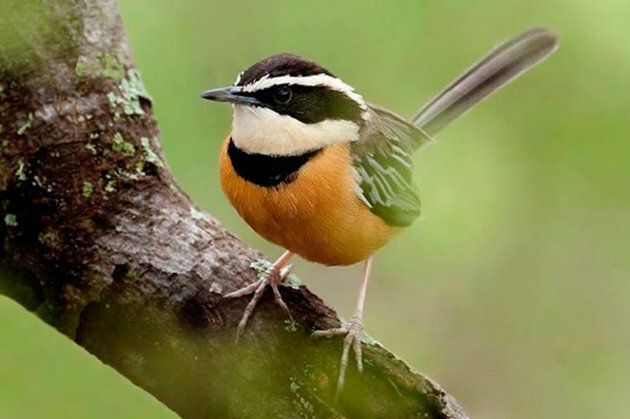 Trevor Hardaker shot this pic of the lovely Tumbes Tyrant, another Peruvian endemic bird. Photo: Trevor Hardaker. We continued with this aggressive strategy and we were rewarded at the nightly list compilation after dinner. 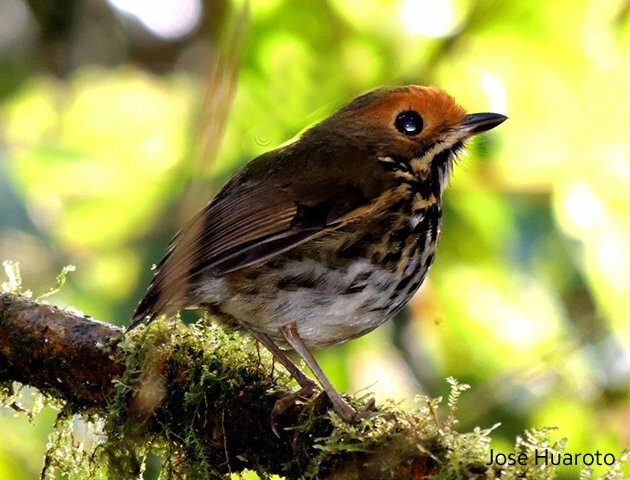 As we entered more forested areas, our collective knowledge of bird sounds became an asset as the teams with experience in the western lowlands began to report lower number of species. We continued to move up in the rankings up to the second place. A personal favorite and a Tumbesian endemic, Henna-hooded Foliage-Gleaner. Photo: Jorge Novoa. Three quarters through the competition, three teams: the Tigrisomas (USA), the Forest Falcons (United Kingdom) and us the Zululanders were clearly ahead of the rest. The competition turned tight and every species counted. Happy with being in second place, we had the east slope of the Andes as the next segment. We were confident things would only get better from here on. Interestingly though, this segment had a tight schedule as teams needed to be down at a point near the lowlands by 1 pm. Approaching this leg wisely and keeping our position in the race was crucial. This portion of the Andes is one of the birdiest parts of the route as bird communities differ along the elevational gradient. A good portion of the east facing slope of the Andes here is encompasses the Abra Patricia–Alto Mayo conservation area a region where some of the largest (up to 30 species foraging together) mixed species flocks have been recorded. 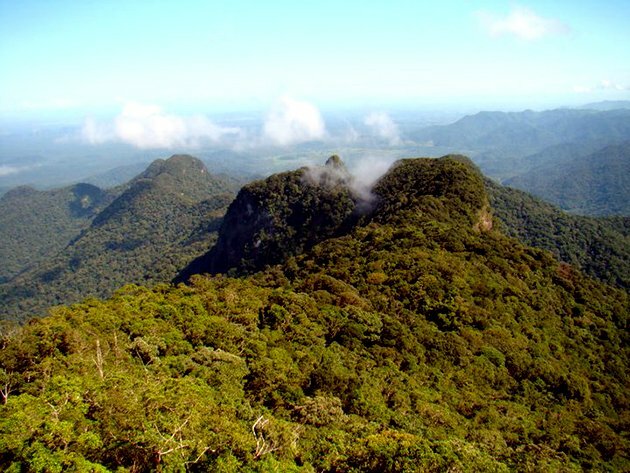 Panoramic view of the cloudforest of Abra Patricia-Alto Mayo conservation area known for some of the largest mixed species foraging flocks. Photo: Peru Birding Rally. What had been working well the previous days might have gone against us this time. We based our strategy on stops where we knew certain key species held territories. We had points for known territories of Cinnamon-breasted Pygmy Tyrant, Rusty-tinged and Ochre-fronted Antpittas, and Chestnut-capped brush-finch; a total of four species. As the previous days, we left early and drove straight to the points we planned to stop. This meant skipping most everything before our intended stop. This time a local guide would take us to the territory of the target species, but this involved a hike off the road and it took us too long to get to the territories and back out on the road. In the meantime other teams stayed on the road hitting flock after flock adding dozens of species while we worked on four. We got back on the road and added a few species and hit the tail end of one of the mega flocks. Soon after that we had to leave to make it to the next mandatory point on time. Live and learn. Many eastern Andean species were missed for good because they do not occur in the eastern lowlands. The deficit would be extremely hard to overcome. Even with a huge effort in the lowlands you can only get so far ahead of the leading teams birding largely the same sites and bird communities. We kept competing thinking we had a chance, but the Tigrisomas and Forest Falcons proved too good to overcome. At the end we came in third. We were satisfied with our effort and final standing knowing we left it all on the birding trails. I had a wonderful time in the company of free-spirit South Africans very serious about winning the competition, yet having a great time along the way. Never a dull moment with the Zululanders. 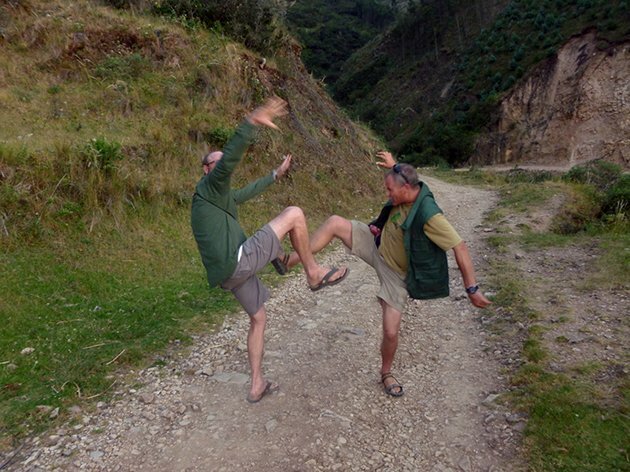 Fraser and Ross perform the crane dance celebrating the addition of the skulker Unicolored Tapaculo to our list. Photo: Alfredo Begazo. It was a fantastic experience everyone of us would love to repeat in another region of Peru. Clare and Grant, you are right, there is a lot more to see in Peru. Just a few degrees south is like being in another place/country all together. It is such as diverse country on every meaning of the word. Glad you enjoyed the note. Hey Frank, yes it was a crazy fun trip. But to some extend I came to this realization after the trip. In the heat of the competition and under such as hectic schedule, there is no time pause and enjoy the moment.